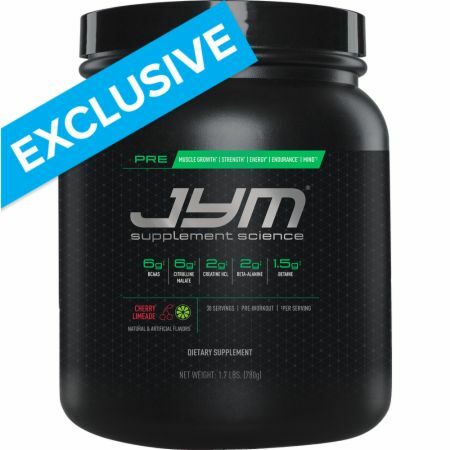 Pre JYM by JYM at Bodybuilding.com - FREE P&P! 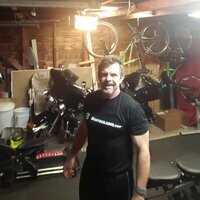 Pre JYM doesn't use proprietary blends. Take a look at the supplement facts panel and you'll see the actual amounts of all ingredients. I have nothing to hide. I'm proud of the amount of each and every ingredient I've included. Pre JYM includes ingredients that complement one another to prime the body for intense workouts, making it a complete pre-workout supplement. If you're looking for the most complete exercise supplement program available on the market today, take my Post JYM Active Matrix after your workout to get even greater amounts of potent ingredients like Creatine HCl, Betaine, and Beta-Alanine. Some companies also try to trick buyers by calling their pre-workout product “concentrated.” A serving of one of these “concentrated” products can contain as few as 3 to 6 grams of powder. What kind of magic did they use to cram enough creatine, beta-alanine, citrulline, arginine, caffeine, and other ingredients into that tiny serving? They didn't use any magic, which is why some of those “concentrated” formulas also include proprietary blends. That's also why the serving size of Pre JYM is more than 26 grams. It contains ingredients at proper, powerful amounts. That's why I developed Pre JYM. I wanted to give my friends, colleagues, all of you, and myself the ability to access, in one bottle, the best ingredients in amounts suggested to support your fitness goals. Research suggests that leucine is the most critical because it stimulates muscle protein synthesis. Creatine increases physical performance in successive bursts of short-term, high intensity exercise. The beneficial effect is obtained with a daily intake of 3g of creatine. Alpha-glyceryl phosphoryl choline (alpha-GPC) is a naturally occurring phospholipid compound. NAC is the amino acid cysteine with an acetyl group attached to it. Caffeine contributes to an increase in endurance capacity and may help to increase alertness and concentration. Do not exceed a daily intake of 300 mg of caffeine. The beneficial effect is obtained with caffeine consumption at doses of 3 mg/kg body weight at least one hour prior to exercise. Citrulline Malate, L-Leucine, Creatine Hydrochloride (as CON-CRET®), Beta-Alanine (as CarnoSyn®), Dextrose, L-Isoleucine, L-Valine, L-Tyrosine, Betaine (Trimethylglycine), Taurine, Sodium (as Disodium Phosphate), Sweeteners (Sucralose, Acesulfame Potassium), Flavouring, Beet (Beta vulgaris) Root Extract, Choline Bitartrate, Caffeine Anhydrous, Alpha-Glyceryl Phosphoryl Choline (as AlphaSize®), N-Acetyl L-Cysteine, Stabilisers (Cellulose Gum, Xanthan Gum, Carrageenan), Colour (Allura Red AC), Black Pepper (Piper nigrum) Fruit Extract (as BioPerine®). For allergens, see ingredients in bold. Produced on shared equipment that also produces products that may contain EGG, MILK, SOYA, TREE NUTS, WHEAT. Directions For Pre JYM: As a Food Supplement, mix 1 scoop of Pre JYM™ in 400 to 1000 mL of water and drink 30-45 minutes before workouts. 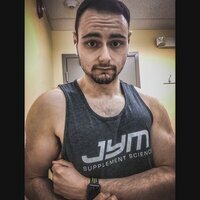 Consider allowing Pre JYM to mix for 10-15 minutes before drinking. Also consider drinking it over the course of 15-30 minutes. Initially use 1/2 serving or less to assess tolerance. Once tolerance is assessed, take no more than 1 serving. To avoid sleeplessness, do not consume within 6 hours of bedtime. DO NOT USE IF YOU ARE UNDER THE AGE OF 18, PREGNANT OR NURSING, HAVE ANY KNOWN OR SUSPECTED MEDICAL CONDITIONS, ARE TAKING ANY PRESCRIPTION OR OVER THE COUNTER MEDICATIONS, OR SENSITIVE TO CAFFEINE. Consult with a qualified healthcare professional before using this or any other food supplement. Contains 300mg of caffeine per serving, the equivalent of approximately 3 cups of coffee. DO NOT USE WITH ANY OTHER CAFFEINATED PRODUCT. Too much caffeine may cause nervousness, irritability, sleeplessness and/or rapid heartbeat. Immediately discontinue use and consult your doctor if any adverse reactions occur. Manufactured in the US for: Bodybuilding.com (UK) Ltd. Units 7-8 Foster Avenue Dunstable, Bedfordshire, LU5 5TA.